Lower Shuckburgh lies on the A425 road between Southam and Daventry. Just north of the village is the Oxford Canal, where there is a small area of car parking. At Beacon Hill to the south, is the deserted village of Upper Shuckburgh. The most notable building in the village is the church of St. John the Baptist, which dates from 1864 and is built in Gothic Style, and is surrounded by a small churchyard in which there are Cedar trees of great size. The war memorial is to be found at the start of the footpath leading to the church. Shuckburgh Hall and Estate is a privately owned country house mansion and estate at Lower Shuckburgh. The estate has been the home of the Shuckburgh family since the 12th century. Shuckburgh Hall was granted Grade 2 Listed Building status in 1952 and is now a picturesque venue for weddings, corporate hospitality, parties and events. The Hall sits within the well established 2500 acre estate and the grounds are home to a herd of Wild Fallow Deer, pheasants and a wide variety of wildlife. The estate has its own 14th century church. Napton on the Hill is best known for its windmill and canal links. It is both a long and large village climbing up to the fine St. Lawrence’s Church, the position of which is something of a test for worshippers. The church is Grade 2 Listed and stands on the summit of Napton Hill in the middle of a small churchyard and was originally built in the later part of the 12th or early13th century. The war memorial is to be found in the churchyard. A local legend tells us, that the church was to have been built where the present village green is located. However, the stones which lay there ready for building were found to have been taken overnight to the top of the hill, and as a consequence the builders decided to erect the church where the Spirits had dictated. The windmill (now a private residence) is a landmark feature on high ground (about 500 ft above sea level) that commands views over a wide area. The Oxford Canal, constructed in the 18th century and one of the most attractive of man-made waterways in the country, sweeps around the side of the village in a horseshoe curve. 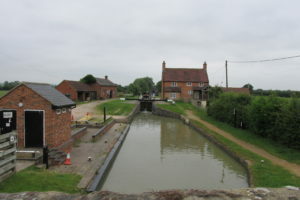 The Grand Union and the Oxford Canal join up at Napton Junction. The canals play an important role in the life of Napton and the village seems to come to life in the summer months with people and colourful narrow boats in abundance. The Christadelphian Meeting Chapel at Pillory Green is still in use. Napton on the Hill has its own school, St. Lawrence Church of England Primary in Dog Lane. Napton Village Stores and Post Office in New Street now has a Café with extensive opening hours. The Folly Inn, alongside the canal by The Locks is a popular and quirky canal-side public house, full of waterways memorabilia and history. The purpose built Napton Village Hall is in The Crescent. Chapel Green on the edge of the village is named after a 14th century chapel that once stood on the site. Nothing of it now remains, but excavations have revealed both Roman and Saxon relics and it is probable that an earlier village was situated there. Priors Marston must be one of the most rewarding of border villages in the county nestling on and under the slopes of Marston Hill. This provides a backdrop to the village and makes an immediate impact. Since 1972 the village has enjoyed Conservation Area status and has some excellent stone houses. There are several houses dated from the mid 17th century including The Old Manor, Westview House and The Orchards that still have thatched roofs. Two other notable properties to be found in Holly Bush Lane are Wesley House (a former chapel, but now a private house) and Falcon House (a former public house). 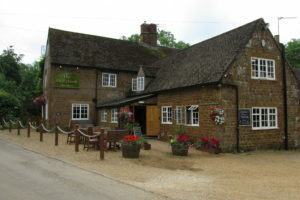 The centre of the village around St. Leonard’s Church includes The Old Vicarage, The Priors School, the Priors Village Hall and The Holly Bush Inn. The earliest known church on the site of St. Leonard’s Church was built in the 13th century. The tower dates from the 17th and 18th century, but the building was largely rebuilt in 1863 as it stands today. There are many fine old trees, mainly Yew and Cedar in St. Leonard’s churchyard, and the two most impressive Cedars standing to the west and the north date back to 1810 and 1814. The overall ambience of the village is attractive with large expanses of well maintained grassed verges and greens, especially around the war memorial at the bottom of Hellidon Road.